Improving automation and technology is typically not an isolated, or silo’ed event. Applications these days rarely operate as a stand-alone, relying on integration with other applications to provide their greater use and value. RTM Consulting helps customers with the logical and physical integration of applications to achieve the right business process outcome. Similarly, technology initiatives are usually comprised of multiple projects running in parallel. Who is keeping track of all work streams, and ensuring all teams are on the same page and coordinated? RTMC can help maintain the overall schedule, budget and communication so its customers can remain focused on running the business. 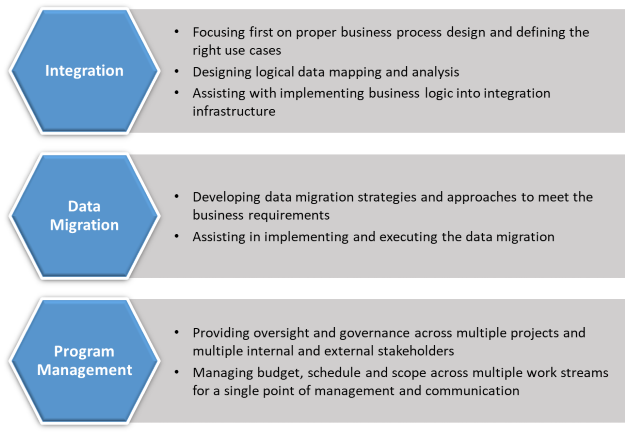 Contact RTM Consulting to discuss our systems integration services.